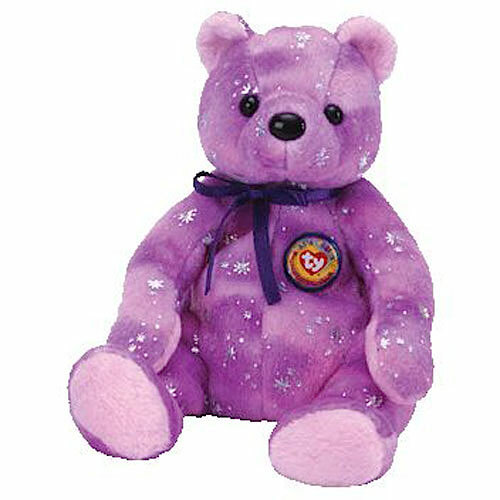 Clubby VI is made from a purple and pink tie-dyed material covered in sparkles. She has black button eyes and a black nose. She wears a dark purple ribbon tied around her neck and a BBOC button on her chest. She has an old teddy bear style of face with a pointed muzzle. So glad you joined the BBOC! Clubby VI was released on 1st October 2003. Her birthday is on 9th April 2003. There are three variations of Clubby VI. There is this purple version with an old style face, a blue version with an old face and a tie-dyed rainbow version with a new style face. All three variations have the same style number. Clubby VI retired on 15th December 2003.